Elder Haskell was born in Ely, Nevada to Arnold Elonzo and Ida Harward Haskell. His early years were spent on a farm near Payson, Utah and at the ranch on Antelope Island in the Great Salt Lake and in also in Salt Lake City, Utah. Elder Haskell served a stake mission and then as a missionary and in the mission presidency in the New Zealand South Mission. He has served in ward and stake youth leadership, on stake high councils, bishoprics, stake mission presidencies, as high priest group leader, and as a branch president at the Provo Missionary Training Center. Elder and Sister Haskell were also service missionaries at the Provo MTC. Elder Haskell was a seminary teacher at Kearns High, Liahona High in Tonga, at the Church College in New Zealand, at Jordon High and Pleasant Grove High. He taught science and math in the Davis, Granite and Alpine School Districts. Elder Haskell married Karen Naoma Rydman. They are the parents of seven children and twenty seven grandchildren. 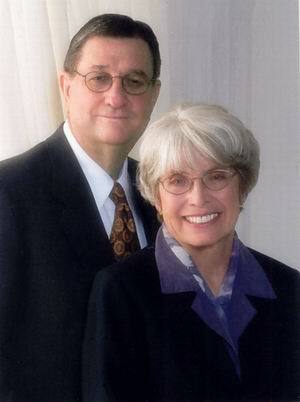 Their home is in the Riverwoods Ward of the Provo Utah Edgemont North Stake. Sister Haskell was born in Salt Lake City to Arthur Emil and Naoma Kistie Brown Rydman. She grew up in downtown Salt Lake City. She has served in various teaching and leadership callings at ward and stake levels for the Primary, Young Women’s, Relief Society and held music callings. Sister Haskell is a former elementary teacher in Utah. She also substituted for the Church Education System in the Tongan Islands. Prior to coming to Cove Fort to serve with her husband, she was volunteering as a reading tutor in her home.